For most parents including me, it's such a glorious deed to persistently run a homework as to what is good and what could be bad to your child. I was, at one point such an hyper, who had to even peep right inside the diaper if a ant had wriggled in, troubling my baby. I would wash an unpeeled orange over and over till someone laughed at me, before beginning to squeeze juice out of it for my child. But it does not end there. If I was over doing it is your idea, no, you get a wrong message. At least when it came to her food and immunity. With both we parents gifted with short sight and having to wear spectacles, I forever ran my homework as to how I shall strengthen my child's retinal nerves, apart from eating carrots. Reminds me of my three year old back from play school told me -"Ms Kitty says carrots are good for eyes, but please give me two of them, as I have two eyes na". It was during those days, that I hogged on lots of study on herbal medication. From age 3, I kept an eye on her eye, so she did not have to design her eyes with spectacles like me. What an day! One day finally at age 5 came her complaints of aching head and mistakes in reading from a distance. My horror knew no bounds. What I was not waiting for, almost happened? I rushed to the eye doctor and alas, she declared "astigmatism". So, we returned home with her heavy eyes! A white framed spectacles that she kept punching every minute in frustration. After flushing out loads of cajoles and wheedles and loving talks that she finally enjoyed her spectacles. But the "specky me of the high school haunted me. My past would walk past my thoughts! "It was from my high school days, that I fantasized the idea of wearing glasses. And god granted me short sight right when I wanted. Then had begun my ever lasting craze of designing my eyes with different frames, not bothering what frame my overall size fitted into. Graduating onto contact lenses slowly I was still living happily even when the popular serial "Jassi Jaisi koi nahi" was flashed on TV screen. This just boosted my confidence. I had never bothered to negate my feeling, just over few friends calling me a specky. You see it was my dream to design my eyes. And then soon reality dawned on me. In the shower, during travels and so on, what an nuisance my eye designer was. Less said is better!" After few dreams haunting me, I decided to do plunge onto to my home work mode again. With Ayurveda doctors in my family, I kept myself aloof from administering bottles of coloured syrup to my child for little fever or a bout cold/cough. Apparently, I was beginning to understand how her antibodies worked wonders by administering only herbal products. One fine day, I rushed to my favourite Prabhu Uncle at Mangalore. Hope he read this post! Prabhu uncle was as usual calm, composed, and in his Amitabh Bachaan voice told me, please start treating her with "Trifala Gratha and "Chyawan Prash". I was immediately convinced with him. The gratha is a form of ghee that is to be consumed with food each night. And the Chyawan Prash to be consumed every evening with milk. Prabhu Uncle's results were out after 2 years. It was like a miracle, that my child's eye designer could be abandoned. Astigmatism went for toss. The Gratha and Chyawan Prash did it's job. The antioxidants and other herbs presence in it gets the product it's high value and protecting power. With doctors in my family, during their study of medicine, we often called them names like guggulu, haritaki or guduchi out of mad humour. And the names sank in so well in our minds and the herbs in our immune system! Though, the practice of consuming the same did not stop there but continues till date. And, come challenge me, she hardly falls sick. Her immune system auto corrects her. Today, a day's cold and I tell her, eat your ice cream tomorrow. Medicine is a rare member in her room. Years ago, if she licked her mud filled hands in play pen my laugh worried other mothers and at times I told them- "all this makes her more strong". It's not any magic. Or if it is there's nothing but the "Chyawan Prash" and no "abra ka dabra". 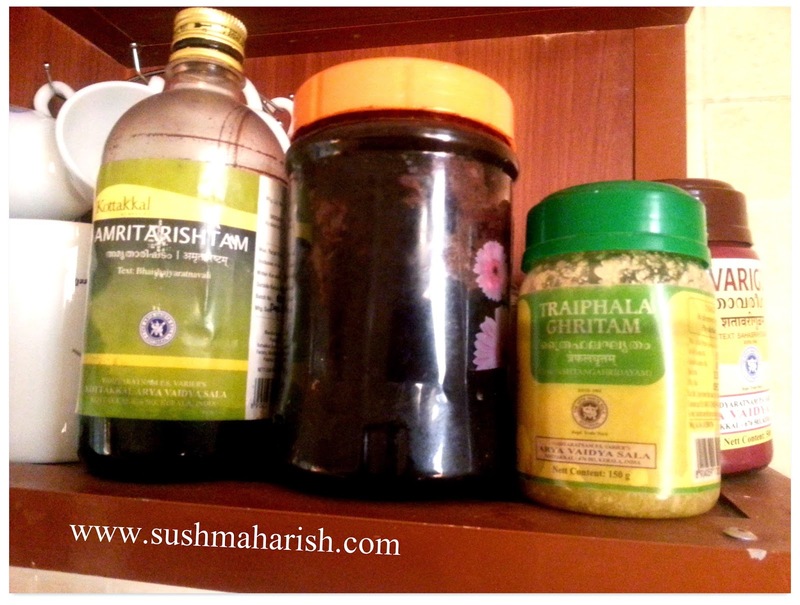 My kitchen counter proudly flaunts a bottle of Chyawan Prash and other stuff forever. The eternal love of it and my child saves me from doing vigorous homework on how to protect her always. Her extra jumps in the swimming pool cant worry me of her catching cold, or her extra classes of badminton cant worry me of her strained calf muscles. As long as Chyawan Prash is protecting her. The entire episode began with my issues of my eye designer, and ended with completely building my child's immune system with the fantastic Chyawan Prash. A healthy child, makes a healthy home. Indeed.